The "hugging saint" spreads love in Alexandria. People from hundreds of miles away went to the Hilton Mark Center in Alexandria, Va., Friday to share an embrace with a woman known as the "hugging saint." Mata Amritanandamayi Devi, Amma for short, a 57-year-old Indian woman, is known for her humanitarian and spiritual work around the world. She'll visit nine cities in the United States this year to share hugs. "What I'm trying to transfer is the purest form of love, so maybe that's why people come here," she said through a translator. Devotees perform a ritual worship at the master's feet, then patiently wait in line -- sometimes for hours -- for a hug. "When you love somebody, you are going to be compassionate and kind, and that's what she's trying to teach us, to spread the compassion and kindness around," devotee Sarala Baliga said. 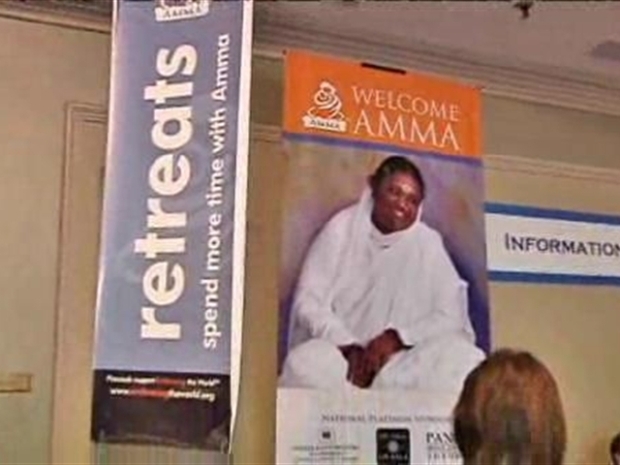 "In today's world, love is very scarce," Amma said. "I am trying to awaken true love in people by having a contact with them." To find meaning in this embrace, you have to see Amma as a mother figure of a divine nature, Baliga said. "I know when Amma hugs she transmits a divine energy to us," she said. The weekend-long meeting is free, but vendors sell crafts, books and food to raise money to support Amma's charities. Organizers expect that she will have hugged 10,000 people by the end of the weekend. "It's an experience," said devotee Gail Courville. "There's a warmth in the room that you might not expect." The hugfest begins again Saturday and Sunday at 10 a.m.